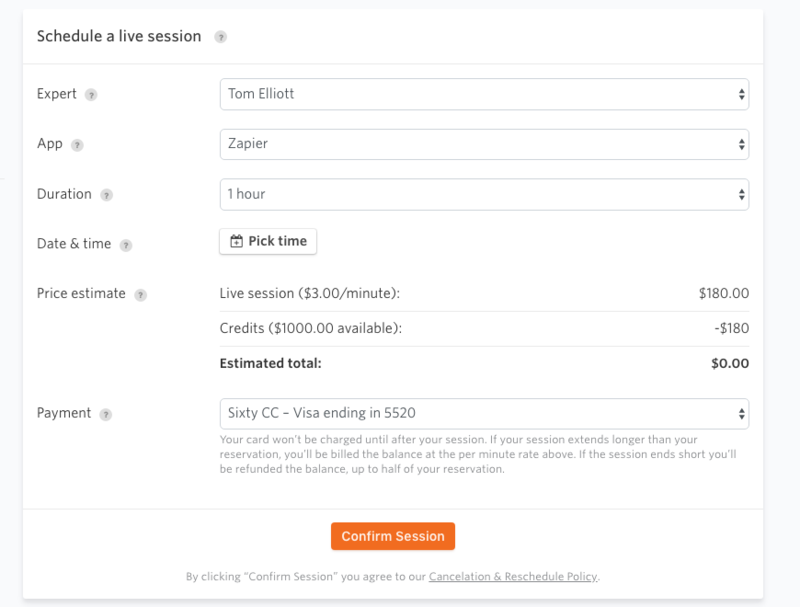 When clients begin an engagement (purchase packaged services, retainers, or packaged hours), you may want to use the Session Portal to work live over video conference. To make this easy, credits are automatically be added to your client's account when they pay for their engagement. This way they can book sessions knowing they won't be charged. Direct your client to schedule a session with you. You can link them directly to the session booking form using this link. When you enter the Session Portal, click the "Unbilled" toggle. This will cause your client to see an "Unbilled" label in place of the timer. It will also confirm there's no charge after the session on the receipt (that typically shows a charge.) Finally, this toggle also hides the request to submit feedback from both you and the client after the session. When the client has used up all of their purchased time with you, ping @david on Slack letting him know, and he'll take away any remaining credits. If a client cancels a session or there's a no-show, and they schedule another session, do I have to re-flag the new session as "free"? Yes, you'll have to re-flag the new session. The easiest way to do this is inside of the session portal using the "Unbilled" toggle. Do I have to start and end the session like I do with paid sessions? No. Only if you want to use the timer to track time for a client report (that you'll send outside of Sixty) or you want to display a formal "Session Ended" message in the Portal when you're done. Message @david in Slack to get a response in minutes. Removing all mentions of payments to the client scheduling form (pictured above) if they're on a retainer, purchased packaged hours, or purchased a packaged service. Creating an "Unbilled Session Proposal" flow. Creating a "100% Free Consultation" flow – You can give a prospective client a link to book a free session with you without entering a credit card. Creating an "Free [x] Minutes Consultation" flow – You can have the client book an initial consultation with you for a pre-determined amount of time (15, 30, 60, etc. minutes.) They'll be required to enter a credit card in before they can book the session. If the session ends up going over the free time, they'll automatically start being billed at your standard per-minute rate. Want to be notified when one of these features is released? Or want to give us feedback on how to make one of them better?